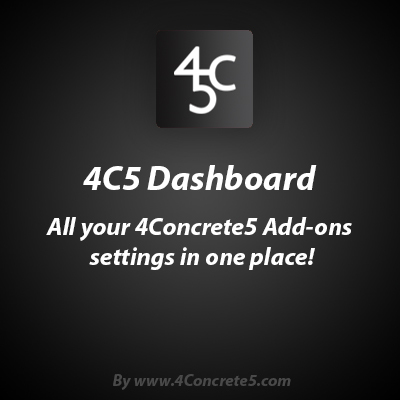 All your 4Concrete5 Add-on settings in one place! We aim to make our Add-ons as 'easy-to-use' as possible; therefore we need to keep things clean and simple. Besides, some settings are required only once. This is why we created one place where you can set all the settings that are required for our Add-ons. Simply download, install and you're good to go! Access your settings: Edit settings for 4Concrete5 Add-ons. Add-ons listing: Overview of all your installed 4Concrete5 Add-ons. Clean and simple: All your settings in one place.